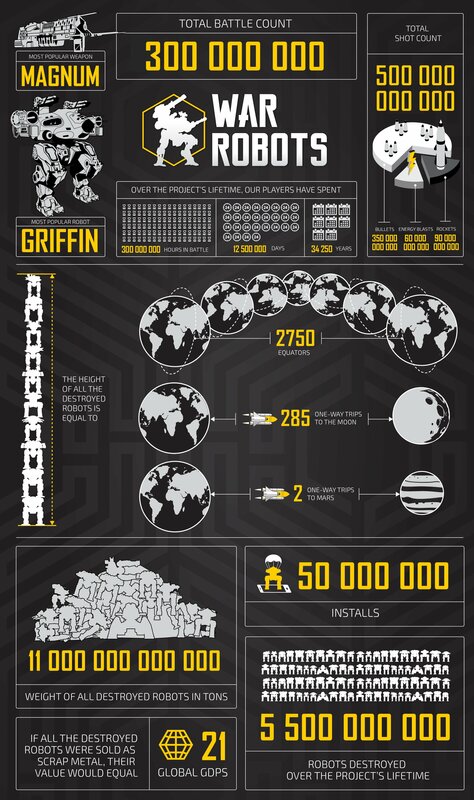 War Robots recently celebrated its 3rd birthday, but it's time for another milestone – a total of 50 mln installs on iOS and Android. Since its release, War Robots players have spent over 34 000 years in the game, taking out more than 5 500 000 000 robots in nearly 300 000 000 matches. All of these are just dry stats, right? What if we turned the numbers into something a little more interesting? Ask yourself – how far would a single file line of all the destroyed bots go? How much money could you earn if you sold all the defunct bots as scrap metal? If you're just as curious about all this as we are, we've got just the thing for you – an infographic that stitches together all the facts (and more).